In our never-ending quest for transparency here on TFD, there are subjects we all naturally gravitate to and avoid, because they are respectively less and much, much more embarrassing for us. We all have our history of youthful mistakes and indiscretions when it comes to finances, and becoming an adult in general, and having to be honest often means being honest about the things we really wish we’d been better about. And for me, there are few topics that are more fraught with my own idiocy than cars and driving. Though I’m still technically the owner of a driver’s license, it’s probably in the best interest of whatever state I’m living in that I not be driving. I haven’t driven myself in about six years (with one brief and scary exception), and though I used to be the girl who prided herself on being raised on a stick shift, who could navigate even the most complicated park jobs in her colonial, narrow corridor-ed downtown, I am no longer that person. After several negative experiences behind the wheel and as a passenger, I realized relatively quickly that I had neither the patience nor the fundamental understanding of automobiles that being a good driver requires. But it’s important to be good behind the wheel in life, because you never know what it might throw at you. And I don’t want to be the kind of person who has to write off a significant amount of travel, simply because it would require that I chauffeur myself. So, in an effort to renew my interest in all things vehicular, and learn some of the most basic things that I’d been afraid to ask for fear of looking dumb, TFD partnered with Progressive to get down to the essentials with cars. 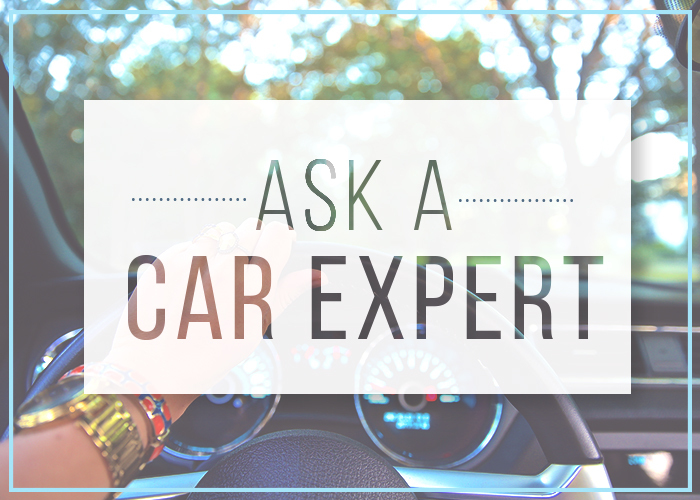 We asked our readers to send us their most embarrassingly-beginner car questions — because, honestly, we should never be afraid of learning about the things we drive every day — and we consulted Gary, a car expert on the West Coast and friend of the site. It was a good reminder to me, and the whole team, that there’s still a lot we don’t know about something we consider so fundamental to day-to-day life. And personally, it’s been a wake-up call that my fear of driving comes, more than anything, from my ignorance. The more I know about the machine around me, and how I can use it most intelligently, the less my car-fear has a chance to grow. This summer, I hope to get back behind the wheel once or twice, if only to go somewhere fun for a weekend without having to navigate the minor circus of planes and trains. And with these questions answered, I feel already well on my way. Generally speaking, the degree of maintenance done on your car will vary, depending on whether your car is new or used. For the purpose of simplicity — and applying to the maximum amount of 20-somethings, frankly — we’re going to focus on maintenance for a used car. Checking the tire pressure on your car will help it run more smoothly and efficiently, using less gas. It’s one of the easiest maintenance issues to remedy, and you can check the pressure by yourself. Pick up a tire pressure gauge, and make sure you check your tires when they’re “cold” (i.e., before you’ve driven or at least three hours after you’ve driven). Brake pads are one of the MOST important items to fix/maintain/repair on your car. The frequency with which you need to change your brake pads will depend on how you drive, i.e. aggressive drivers who brake hard and often will need to do it more frequently. Generally, a good rule is every 40,000 or so. Each tire on a car carries a different amount of weight, which means they all get worn down at different rates. Rotating your tires gives the set a chance to even out those rates, so one tire doesn’t go kaput faster than the other ones. To figure out how often you should be rotating tires, check your car’s owner’s manual! (Crazy, I know.) It will usually tell you how often to rotate your tires, but a rough rule of thumb is that it should a tire rotation should take place every ~8,000 miles. And a couple quick hits that take a few minutes but are always worth it: checking and topping off coolant level in your radiator, checking and topping off brake fluid, checking and topping off/replacing your windshield wipers and the fluid. 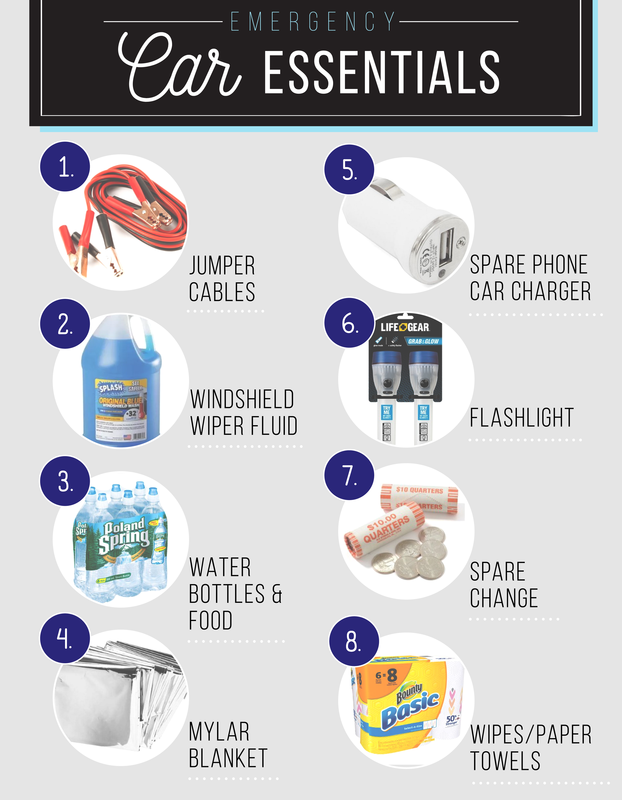 Don’t be caught in the rain (or the dust) without them! 2. What are things everyone should have in their car? I don’t just mean for winter driving but like year round too. Dead batteries happen, and you need a way to fix it, so you can get moving again. If you need to be able to see in front of you — AKA always — you need spare fluid on hand. And no, it’s not in case you’re suddenly “hangry” in traffic. Emergency situations happen, and you may have to wait a while for someone to come get you. It’s useful in both hot and cold conditions, but you don’t realize how much you need one until you need one. The last thing you ever want is to be stranded or lost with a dead phone. Keep one charger just for your car. SPARE CHANGE | Cost: A few rolls of quarters will do. Because you never know when you’ll forget that E-Z Pass. And you will. 3. I’m not sure if this qualifies as basic (though it’s certainly a financial concern). At what point is doing “just one more repair” on a car and keeping it outweighed by the value of getting a new/’new to you’ car? For example, I have a car that I bought used for a very low price, but I’ve since sunk as much money as I paid for it into repairs. When is it worth just pulling the plug and getting a car with a check engine light that actually stays off? That is a tough question, especially since we don’t have the specifics of your situation, in terms of your work, salary, average car bills, etc. However, it’s safe to say that you shouldn’t be spending over 10% of your annual income toward a car or car repairs as a general rule. Whatever that number might be for you, figure it out and work backwards from there. Particularly if your car is a crucial element of your daily routine (and doing little things, like keeping your job), it’s imperative to get the most dependable bang for your budget. So in your case, first, figure out what the book value of your car is worth (using sites like Kelly Blue Book). If a car is actively costing you more in repairs or maintenance in a year than it’s worth — and you’ve already counted for all the repairs or maintenance you are capable of doing yourself — it might be time to cut ties with it. If that’s not possible in the immediate future, price the upgrade out over the next few months to a year, and see how — through a combination of smart budgeting and supplementing your income — you can make the investment in the car (new or used, bought or leased) that best fits your needs and budget. It’s easy to get stuck in a cycle of driving around in a money-pit beater, but if you have done the calculations and figured out you need to upgrade, you have to start treating it as the hard savings goal it is.